Are you and your child looking for FUN and ADVENTURE? Contact us to find out more information today! A proud unit, charted by the Glacier Hills Association since 1960. A service unit, that focuses on conducting projects for our local communities and it’s members. An outdoor unit, holding at least two family camping trips every year and multiple other outdoor outings that have included hiking, fishing, field games, sports, Estes rocket launches, and more! A family unit, while Cub Scouting is for Kindergarten – fifth grade boys and girls, we welcome the whole family to attend and participate in most of our activities. A racing unit with our very successful and popular Pinewood Derby Races held every January for scouts and siblings. A trained leader unit, insisting that all registered leaders complete Youth Protection and Leader Specific training to help make sure our program is top-notch and our scouts are in a safe scouting environment. Since its beginning, the Cub Scout program has been a fun and educational experience concerned with values. Besides providing a positive place where boys and girls can enjoy safe, wholesome activities, Cub Scouting focuses on building character, improving physical fitness, teaching practical skills, and developing a spirit of community service. 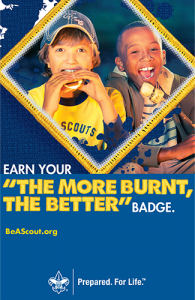 From building a pinewood derby® car to learning to roast the perfect marshmallow with friends at a family campout, your child will LOVE Cub Scouts.